Fashion-forward or not, you may well know that frames have come several light-years since being part of the "medical devices" they were in distant generations. Sure, you can still get the conservative styles, but nowadays there are also countless frames in a huge selection of colors and combinations for the hip and the hip-hop generations and virtually every audience in between. Your passion for fashion is our pleasure! and many more-- have made their presence felt. You can see scores of these frame styles on display at Advanced Eyecare of Arizona, ready to be fitted on the bridge of your nose by any of our opticians and stylist/assistants. Buy one pair or buy several and get a 20% discount for each pair after the first in order to complement your wardrobe for every season. With movie, TV, and music stars often sporting dynamite sunwear when they're outdoorseven indoorsemulating them has become de rigueur for many patients, and often your vision insurance will foot the bill. Or, of course, you can get sunglasses that may be for you and you alone. Looking for a specific material due to allergies? We can help you with that. You only like plastic frames? We have got you covered. Our collection of frames includes various metals, plastics, half frames (rimless) and invisible frames (drill-mounts). We have the frame that you are looking for. Do you feel that you are a challenge to fit for eyeglasses or do you have a hard time finding a pair that is "you"? Well, with decades of experience between us, the staff here at Advanced Eyecare of Arizona can not only offer you tried and true fashion advice but we can also ensure that your glasses fit you like a glove on the day you pick them up. Already have a frame? Bring it in and let us take a look at it. We are more than happy to keep you in a frame that you are comfortable with, we just want to make sure it will last as long as your new lenses will before we get your glasses started. Our staff is certified by Carl Zeiss Vision, creators of the first generation of cameras as well as the latest, and are very experienced with and knowledgeable about the wide variety of products offered by such fundamental name in the eyecare industry. ​We are more than happy to explain the latest in free-form digital progressive lens designs (processed by super computers based in Germany), the advantages of the hyper-index lens material, or the super-hydrophobic and oleophobic properties of the latest anti-reflective lens treatments. If you have high myopia (nearsighted) or hyperopia (farsighted), the lenses that once resembled soda-pop bottles have long been replaced by high-index plastic, hyper-index plastic, high-definition lenses, high-index aspheric, and others that are lab-ground to be so slender these days you'll be thoroughly amazed by the impressive, super-thin end result. For the presbyopes (bi- and trifocal wearers) among you, the lineless progressive lenses make the finished product look as though you're wearing single-vision lenses and leading to a more youthful look. We have over a dozen state-of-the-art designs to offer you! For 2014 and beyond, computer users can select lined or unlined lenses for precise, super-sharp images close-up, at monitor/keyboard range, and any distance away. Polycarbonate, Trivex, UV treated and Transition lenses offer you the best protection available against the dangerous ultra-violet (UV) light. UV light is a known factor in many eye health problems and early protection can be instrumental in problem prevention down the road. Did you know that UV light is something to be concerned with even on cloudy and overcast days? Even on those days where the sun cannot penetrate the cloud cover, UV light can and still poses a threat to your eye health. 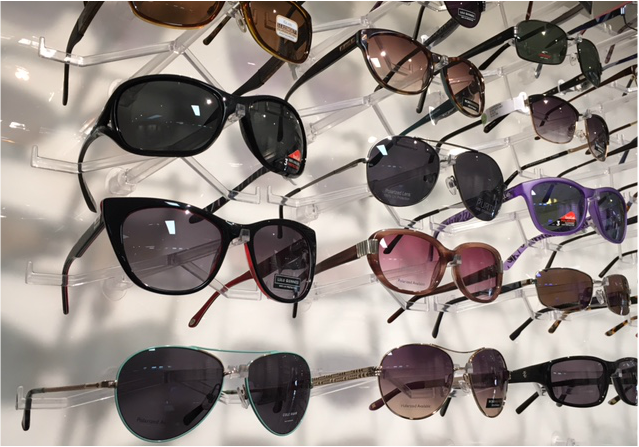 At Advanced Eyecare of Arizona we understand the importance of protecting your eyes and will help you make the best choice in selecting your eyewear. Anti-reflection, Non-glare, "magic coating", no matter what you call it, we offer the latest in glare/reflection reducing lens treatments that are designed to sharpen your vision for a wide range of activities. From reading a book to driving at night, read subtitles at the theater and reduce eye strain from computer work, our lens options are designed to maximize your experience no matter the task. Transition lenses, which darken in sunlight, have been popular since they were developed, and interest in them shows no sign of fading. And yes, Advanced Eyecare of Arizona has the newest generation for your viewing pleasure. Polarized lenses offer not only the visual comfort you would expect from your eyewear, but the safety you deserve as well. Polarized lenses use a special filter to block reflected light (light becomes polarized as it bounces off a surface) from reaching your eyes, this not only eliminates glare in your vision but helps to make the world a clearer place during harsh sunlight. With Arizona having over 300 days of sunshine every year, if you are not wearing polarized lenses, you are not seeing the full beauty of our state. Our frames and lenses come with a 2 year warranty starting the day you pick them up!! EnChroma lenses offer a one of a kind vision correction for patients suffering with certain types of color vision deficiency. We are happy to offer this technology to our patients with in-office evaluations and fitting of EnChroma lenses. We are able to fit these lenses in a large range of frames and multiple lens types. We use many of the newest, proven designs in both soft and gas permeable contact lens technology. We design lenses to treat nearsightedness, farsightedness, reading problems, driving problems, astigmatism, imperfect surgical vision results, corneal diseases such as Keratoconus and more. Whether for work, school, sports or play, contact lenses are FDA class 3 medical devices, and as such warrant proper care and use to avoid complications. Don't worry, we have you covered here. We make sure our patients are trained to avoid those complications. Contact lenses provide many of our patients with improved field of vision, confidence, sports performance and convenience. Our individualized care is detailed and thorough. We use the latest designs coupled with our experience and training. If you take our advice and you are not satisfied with the final result, we will credit your material cost 100% toward the future purchase of eyeglasses, we call it our "Guaranteed Contact Lens Success Program." Follow-up care is important to us and our staff has over 50 years of combined experience in the field of contact lens design and care. We educate and teach each patient every step required to properly use and care for your contact lenses. We provide take home material, instruction sheets, and complimentary cleaning kits. For any concerns, our Board Certified Doctors and Opticians are never more than a phone call away. Eyecare that you can trust is important to us and because of that our level of care and financial protection is something not provided by mail-order and "big-box" lens companies. We believe your top eye care priorities should be trust and quality. For our contact lens patients, we include your follow-up appointment, complimentary solution kit, and no additional charges for modifications or reorders should your vision or comfort be less than expected.